The Aquarium was designed by Eugenius Birch, who also dreamt up the West Pier, and construction started in 1869 at a final cost of £130,000. The recent launch of the excellent new Tropical Reef feature at Brighton’s Sea Life Centre provided a good opportunity to look around the Grade II Listed subterranean structure. The opening of the Aquarium on 10th August 1872 appropriately coincided with a meeting of the British Association of the Advancement of Science. It was built along the new sea wall between Marine Parade and the newly formed Madeira Road (now Madeira Drive) and lay below the upper promenade, so as not to spoil sea views, as insisted by Brighton Council. The entrance, on the west, was reached by a flight of steps down to a courtyard built in a Pompeian style with five brick arches and terracotta columns. An impressive entrance hall led to a 224ft corridor with vaulted ceilings and bath stone columns. The corridor, lined with large back-lit tanks, and most of the rest of the 700ft development, were built in a romantic Gothic style. Along with the largest fish tank in the world, big enough to house the largest whale, there was also a conservatory, restaurant and reading rooms. A roof terrace was completed in 1874 along with a clock tower, gateway and toll-houses in front of the courtyard. 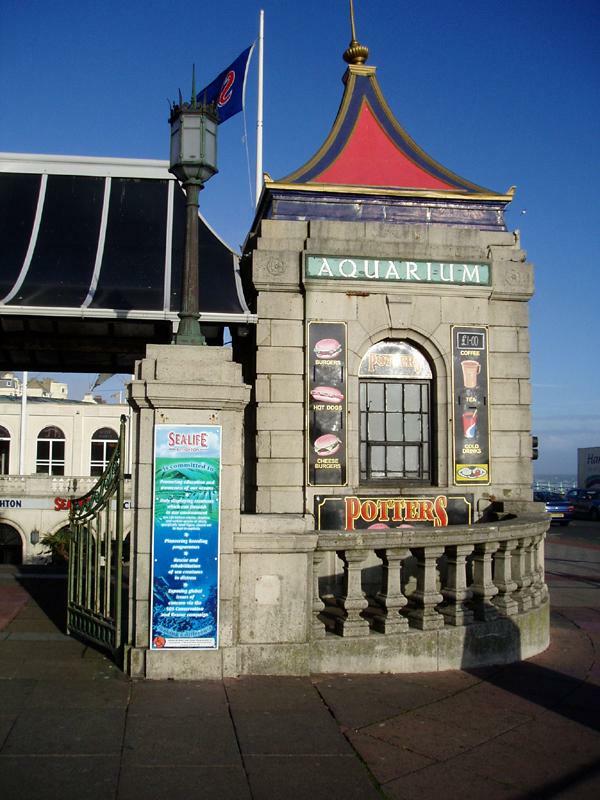 By the early 20th century, the Aquarium was no longer a popular tourist attraction and was in financial difficulty. As a result, Brighton Corporation purchased the building and business in 1901 for a mere £30,000. From 1927-29, the exterior was rebuilt in the neo-classical form that it takes today. Twin kiosks replaced the clock tower and a new entrance hall, restaurant and concert hall were built. The redesigned roof terrace had a bandstand and ballroom. Interestingly, the clock itself was reinstalled in a simple tower on the Palace Pier. Today, the Gothic corridor still survives and is as impressive as ever and the top attraction is the glazed walkway through the shark pool. The terraces above the building have been turned into a massive venue, suitable for a nightclub, but an operator has yet to be found. What would Eugenius Birch think if he was alive today? His West Pier is gone and his Aquarium has been greatly modified, though he does have a Brighton bus named after him. So that’s Advancement of Science!